I was reading an article over at digital-photography-school.com on shooting water droplets and decided to give it a try. Two upside-down bowls in the sink on top of each other. I filled the the top white one with water to the top. Nikon D70 with 18-70mm on a tripod. SB600 Speedlight about 15cm camera left and triggered via Commander (i.e remote trigger). 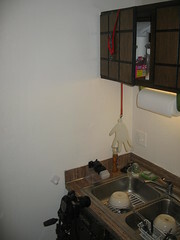 Water dripped down through a latex glove that I poked a hole in and suspended from the kitchen cabinet using Dunstan’s cat leash. On a somewhat related note, I may have some exciting news tomorrow. Be sure to check back for that!